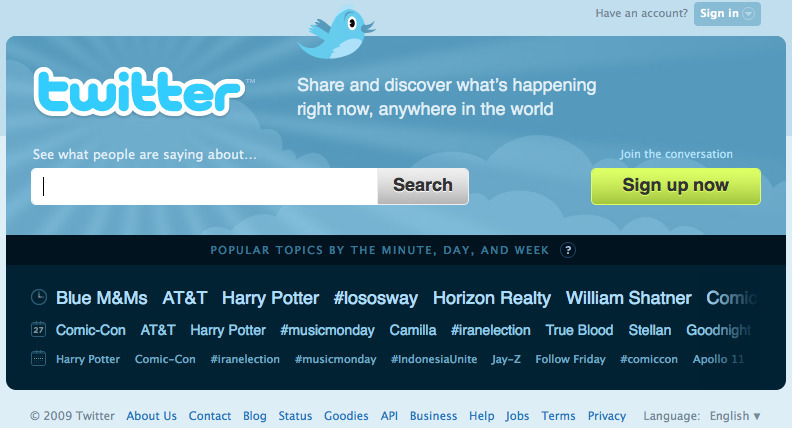 Today we're trying a redesigned front page for folks who are new to Twitter.com. If you're a regular around these parts, then you won't notice the new look unless you sign out of your account. Helping people access Twitter in more relevant and useful ways upon first introduction lowers the barrier to accessing the value Twitter has to offer and presents the service more consistently with how it has evolved. Twitter began as a rudimentary social tool based on the concept of status messages but together with those who use it every day, the service has taught us what it wants to be. From features invented by users to applications built on the platform, we're still discovering potential. Twitter has moved from simple social networking into a new kind of communication and a valuable source of timely information. Also, it's fun. Defining a "tweet" for the uninitiated and explaining how to create an account doesn't resonate with everyone. "Why would I want to do that?" is a common reaction. However, demonstrating the power of Twitter as a discovery engine for what is happening right now through our Search and Trends often awakens a sense of wonder which inevitably leads to a much more compelling question, "How do I get involved?" The open and timely exchange of information will have a positive impact on the world and Twitter has a role to play. We have a lot of work to do when it comes to the quality of our search results and trend analysis but repositioning the product to focus more on discovery is an important first step in presenting Twitter to a wider audience of folks around the world who are eager to start engaging with new people, ideas, opinions, events, and sources of information. We'll likely continue to make changes to the Twitter home page as we respond to feedback and ideas. We're eager to see if encouraging a sense of wonder and discovery leads to a better first impression of Twitter.